In the UK, the WMA indices are quite popular with "wealth management" types for benchmarking performance of clients' multi-asset portfolios. 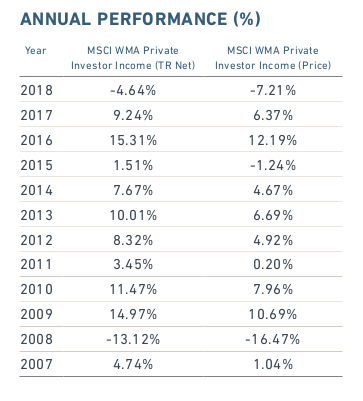 I'm interested in finding the historic values of the WMA Private Investor Income Index (total return) for the last 5-6 years with quarterly (or, better, monthly) frequency. But I can't find anything with higher frequency than that. MSCI do have a web page here which can be used to query end-of-day index values on specific days but while it has a pull-down for "Index suite" which includes a "WMA Private Investor Indices" option, it doesn't actually seem to include them. However the page does say it only serves up "any global, regional or country MSCI index" and it's possible the WMA indices are considered to be a different category to those. Browse other questions tagged united-kingdom historical-data market-indexes financial-advisor historical-analysis or ask your own question. What is the current substitute for the Value Line Composite Index? Where can one download monthly index fund prices from the deep past (40+ years) until today?